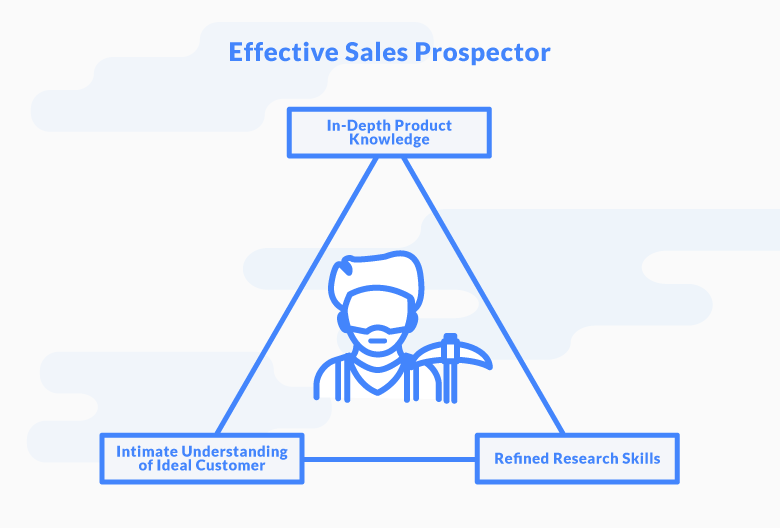 Just as an effective gold prospector needs to know where to dig, an effective sales prospector requires an eye for high-quality leads – and knows where to find them. This article will explain what sales prospecting is, how it works, and how to do it well – including what skills, techniques, and tools a prospector needs to be successful. 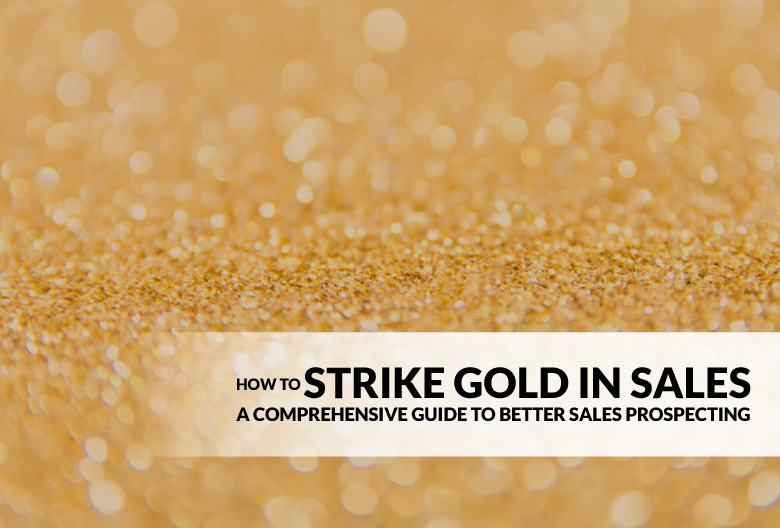 Because improving your sales prospecting process will enable you strike gold more often, generate new revenue streams for your business, and increase your profit margins. Sales prospecting is the process of finding potential customers. Along with inbound marketing, networking, and customer referrals, sales prospecting is an important step in customer acquisition – and the lifeblood of your sales pipeline. Sales prospecting often takes the form of outbound selling to generate new leads. That is, cold emailing and cold calling. However, inbound prospecting (reaching out to leads who have expressed awareness of or interest in your business) is becoming a more popular prospecting approach. Sales prospecting can also involve nurturing old leads that have grown cold. In the majority of cases, you typically contact leads by phone or email in an attempt to open up new sales opportunities. The goal is to keep your sales pipeline full of high-quality leads that are likely to become customers. Who Should be Responsible for Sales Prospecting? The answer depends on your business size, stage, and budget. In most cases, people in one of these three roles are in charge of prospecting: the company founders, individual sales reps, or dedicated SDRs. Early stage startups often don’t have a designated sales team, which means the owners or founders are responsible for just about everything – including lead generation, lead nurturing, and sales. Small or growing companies tend to hire jack-of-all-trades sales reps who are expected to own the entire sales process from start to finish. That means they handle everything from lead generation to signing the deal. This is a more budget-friendly option than hiring specialists, but the trade-off is lower efficiency. Once your business is big or profitable enough to warrant hiring a specialized sales team, you’ll want to hire sales development reps (SDRs) who are dedicated to finding and qualifying leads. Their job is to ensure your account execs have a reliable stream of new opportunities to focus on selling. Whoever is doing your sales prospecting needs to have these three characteristics. In order to spot other people who could potentially benefit from your product or service, your sales prospector needs to know the product inside and out. Not just the core features that everyone is familiar with, but the product’s strengths and weaknesses, all potential use cases, and new features expected to roll out in the future. To find new customers, you need to know everything there is to know about your existing customers. Your sales prospector should be able to pick out details like which job titles are most likely to advocate for your product, which under-serviced industries have a growing need for your solution, and who your happiest long-term customers are (and why). Sales prospecting involves digging through websites, lead gen software, social media, and a range of other sources for customer data and information. And if a prospector doesn’t know exactly where to find a piece of information, they still know where to start their search. A sales prospector uses your buyer personas and customer data (like buying history, business size, location, and industry) to identify new leads that fit your ideal customer profile. Once your prospector has a list of companies and individuals who might want to purchase from you, they need to learn as much as possible about those leads – including what solution they’re currently using, what their biggest pain points are, and who is responsible for purchasing decisions. Although collecting contact data (like finding the right person’s email address) is one of the trickiest parts of lead generation, a good prospector can get through the gatekeepers to reach the decision-makers directly. Cold Calling: This is the classic sales activity that comes to mind when you think about outbound sales. Cold calling involves making unsolicited contact with potential leads in an effort to sell your product or service. Cold Emailing: Another form of outbound sales prospecting, an effective sales email captures the recipient’s attention in the subject line and opening sentence. This is your chance to highlight the value your prospect stands to gain – not just the benefits of buying your product, but the value they’ll get from responding to your message. Social Media Prospecting: More and more sales teams are recognizing the power of social media as more than just a marketing tool. Depending on your client base, different social media platforms can play a role in your lead generation process. Warm Emailing: Warm emailing falls under the umbrella of inbound prospecting. This is when a lead has already expressed interest or interacted with your business in some way. Maybe they downloaded your e-book, spent a bunch of time on your pricing page, or signed up for your mailing list. Whatever the case, they’ve indirectly told you something about their intentions or interests that you can use to write a warm email. Social Selling: Social media provides another channel for sales reps to interact with prospects. Integrating social selling into your sales prospecting strategy might involve reaching out to your followers directly or messaging someone who asks a question related your product or industry on Facebook, Twitter, or LinkedIn. Most prospects require multiple interactions and follow-ups before committing to a purchase. So, whether it’s done by an SDR or an account manager, nurturing your leads with email campaigns, phone calls, or targeted offers is an important part of the prospecting process. This is especially true if your product or service is complex, has a high price tag, or has a particularly long sales cycle. Perusing a prospect’s Twitter page can be a good way to learn about their values, interests, and opinions. You might use Twitter to see who’s participating in talks about your industry, looking for a solution just like yours, or to learn more about a lead before shooting them an email. LinkedIn is another great social media platform for prospecting, especially in B2B sales. You can catch up on a company’s latest news, announcements, events, and content – and then use that information to qualify them as a lead and engage them in conversation. If you want more specific data about your prospects and their companies, LinkedIn Sales Navigator might be right up your alley. It’s a paid service that uses a prospecting algorithm to help you find customers and identify decision-makers. This is a free, easy-to-use tool that allows you to receive custom alerts on keywords relevant to your prospecting process. By tracking specific terms, you can keep up with mentions of a company’s name, industry trends, and competitor news. Timing is half the battle in prospecting. If you’re in the tech industry and want to target customers as soon as they’re ready to replace an old solution, Datanyze is the tool for you. It tracks when companies start and stop using different tech solutions, so you can connect with prospects as soon as they’re on the market for a product or service like yours. Not only does Propeller CRM help keep track of your sales activity, opportunities, and contact details, it also allows you to easily run cold email campaigns to generate new leads. You can also schedule automatic reminders, so you never miss an opportunity to follow-up. 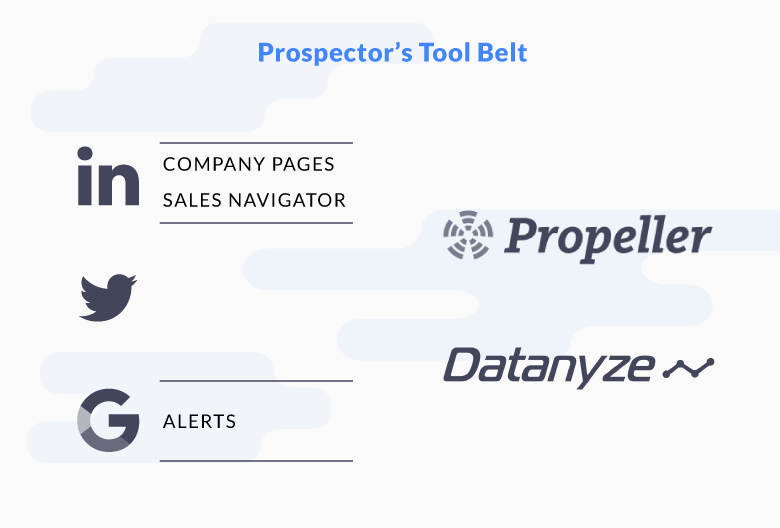 Though prospecting is the bread-and-butter of your business, it can be time-consuming and resource-intensive (especially if you don’t enlist the help of a robust CRM like Propeller). However, there are a few things you can do to make prospecting a less daunting task and get more results for the effort you put in. The job of a sales prospector is never done. Keeping your pipeline full of leads requires a proactive approach, which means actively cold calling, cold emailing, and networking – even at times when you don’t actually need new leads. If you haven’t created an ideal customer profile yet, spend some time reflecting on who you top five or ten customers are and look at what common traits they all share. This might include company size, location, decision-makers’ job title, the amount of nurturing required, budget, type of product purchased, or some other characteristic. Compare potential leads to your ideal customer profile to build a high-quality list of prospects. The more targeted you can be at the prospecting stage, the more likely you will be able to convert prospects into paying customers – which means more sales, higher revenue, and less wasted resources. Customer referrals can decrease your customer acquisition cost and connect you with sales qualified leads – all without much effort on your part. Whether you do so by email, phone, or in-person, the best time to ask for referrals is right after a successful sale, since that’s when the experience (and excitement of a new purchase) is still fresh in the customer’s mind. Your prospects are busy people. Successful prospecting requires convincing leads that you (and your product or service) are worth their time. One of the best ways to do that is by demonstrating you’ve done your homework before contacting them. This might mean connecting on a personal level or proving that you understand their company’s needs, pain points, and goals. If you can demonstrate that you ‘get’ a prospect from your very first interaction, they’ll be more likely to listen to your pitch and agree that your solution is a good fit for their needs. So, whether you mention that you noticed they downloaded your e-book or reference the fact that you both went to the same university, try to find a relevant connection. We’ve said it before and we’ll say it again: you’re missing out on sales if you don’t follow up. 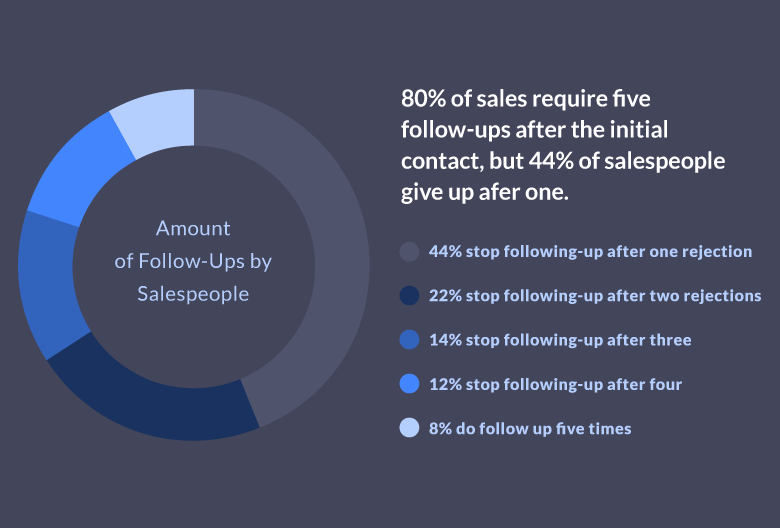 That’s because 80% of all sales require at least five follow-ups to close – yet 44% of sales reps give up after a single rejection. So, unless you’re calling, emailing, or otherwise reaching out to your prospects five or more times after your initial contact, you’re leaving money on the table. Go through your call list and check in on where your prospects are in their decision-making process. Perhaps they have questions you can answer or would benefit from an upcoming webinar you’re hosting. If you find yourself forgetting to follow-up within a reasonable timeframe (or at all), you should enlist the help of a robust CRM like Propeller to keep you on track. Want to start using Propeller for free? Start your 14-day trial today!